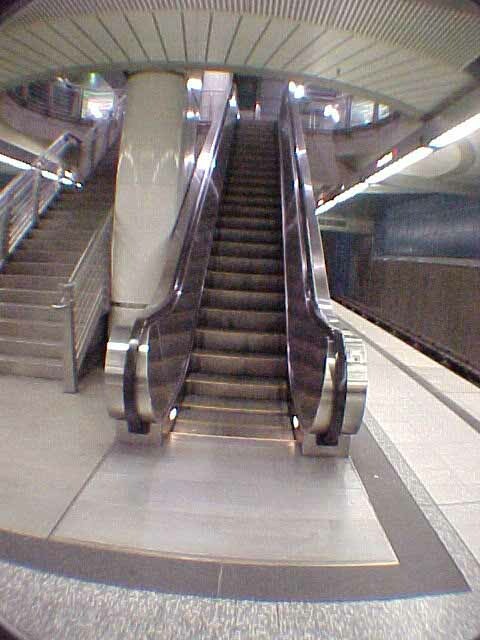 theres an escalator at the wilshire and vermont metro station who would prefer not to have pictures taken of it for purposes of this interview. early last summer it broke down, it has remained in disrepair to this day. it's an outdoor escalator. a proud escalator. and yet its hand rails flop down. its steps have been removed and wires and metal and dirt and trash have collected and has broken this fine machine's very spirit. and that's why it doesnt want any damn pictures of it. born in osaka, japan the night the first mile of the Red Line was completed, this sad "people mover" agreed to this exclusive interview as long as it wasn't photographed in its current state. it's brethren, escalators from all over the metro red line, however, asked to be photographed for this report. "we want people to know that we're all in support of her. that could be us out there." Lefty, a Sunset / Vermont escalator said. "There are very few things uglier than a mangled escalator. Sarah Jessica Parker's get-up at the Golden Globes was pretty bad, though."